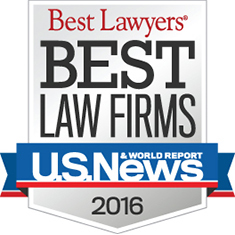 (CHICAGO) Katten Muchin Rosenman LLP today announced that the firm was honored in 41 practice areas both nationally and in the metropolitan areas of Austin, Charlotte, Chicago, Los Angeles, New York, Orange County and Washington, DC as part of the U.S. News – Best Lawyers® 2016 "Best Law Firms" ranking. "The recognition we continue to receive across a diverse range of practice areas each year speaks to the depth of experience of our attorneys and the excellent client service they provide," said Katten Chairman Vincent A.F. Sergi. Nationally, Katten was ranked in three new practice areas (Entertainment Law – Music, Litigation – Bankruptcy and Trademark Law), and was elevated to the highest distinction in Securities Regulation. Additionally, the firm was recognized in four new areas (Litigation-Antitrust, Patent Law, Criminal Defense: White-Collar and Trademark Law) across Katten's metropolitan area rankings in Chicago, Los Angeles and New York. U.S. News – Best Lawyers®, the leading survey of lawyers worldwide, together rank more than 12,000 firms in 122 practice areas in 185 metropolitan areas and eight states. In each of the 74 practice areas ranked nationally, only one law firm receives the "Law Firm of the Year" designation.